one of the four largest fishing grounds in the world. The Sea of Okhotsk is one of the four largest fishing grounds in the world. 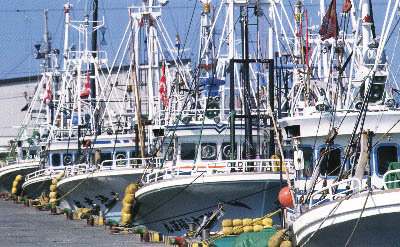 Fisheries in Mombetsu have been making the most of these rich resources and the marvelous natural port of Mombetsu port. Fisheries have played an important role as a mainstay industry in Mombetsu throughout its history. The Japanese like to eat seafood. Mombetsu, which faces the Sea of Okhotsk, is one of the busiest fishing ports in Hokkaido, and has grown prosperous with fishing as its basic industry over the course of time. The focus of fishing has shifted from collecting to cultivating, and, in accordance with the development of techniques for seafood cultivation, highly productive fishing practices are promoted. The principal seafoods produced are scallops, which are plentiful and consistently high in quality, and crabs, a famous food from the Sea of Okhotsk.